Try Our Hook & Loop It’s Not Velcro! Yes we carry hook and loop and no it’s not Velcro! You can check out the video below put out by Velcro that explains it with a good laugh! Now let’s talk about our hook and loop. We offer it it black, blue and white in both 1/2″ and 3/4″ widths. The rolls are 75′ in length. The advantage of hook and loop in a roll versus a a pre cut strap is flexibility. You cut just what you need, no more. There are many applications where a standard 8″ strap will just come up short, or long for that matter. Quality. You can find cheap hook and loop just about anywhere online. But the right quality for the money is always a challenge. As a matter of fact, finding the right balance of price and quality when online shopping is a challenge with many products. That is why we feel we have an advantage with our hook and loop and really our entire product line. We are started as and continue to be a brick an mortar company that deals face to face with the tradesman who use our product. We don’t put things on our site that we couldn’t sell with confidence in person. Before we picked up our hook and loop line, we sent it around and made sure that it works well for cable management. Selection. We currently offer our hook and loop in three colors and two widths. Sometimes something as simple as color can really make your cabling job pop. Black still seems to be the go to but the white and blue really have their place. So remember, our hook in loop is not Velcro, watch the video, the Velcro folks explain it nicely! Stainless Steel Bridle Rings. If your application is in a harsh environment containing certain chemicals or outdoor use, you may be looking for a stainless steel bridle ring. Our bridle rings are 316 stainless for added corrosion resistance. Available in both 1-1/4″ and 2″ diameters with either a screw end made to screw directly into wood or a 1/4-20 thread version. The 1/4-20 thread stainless steel bridle ring can be used in conjunction with a beam clamp, Sammy Screw or concrete anchor for installation. While designed for installation of cable, we know our customers are finding many outdoor uses for them including marine and garden applications. All of our stainless steel bridle rings are sold in packages of 20 to help you buy just what you need for the project. If you need help finding a suitable anchor for your install, give us a call toll free at 1-877-212-2377 and we will do our best to help out. While you likely won’t find many installs requiring a stainless bridle ring, when you need them, you now have a source! We recently picked up the MagDaddy line of magnetic cable management products and want to spotlight the magnetic j hooks and bridle rings that are finding their way on to more and more projects. We offer the magnetic j hooks in both side mount and top mount versions in 3/4″. We will be adding the 2″ shortly as well. We do offer the female magnetic mount as a separate part as well if you want to make your own or have the ability to make the size or type you choose on the fly. You can install the top mount j hooks to the metal ceiling from the floor with the MagDaddy install tool as well. Check our site for videos of the magnetic j hooks in action. As with so many new products that may cost a little more at the outset, the real savings of a magnetic j hook comes in with time savings. Other than speed of install, any rework can be accomplished more quickly, just pull off and re install. You may also find some applications where the customer will not allow you to screw into the roof deck. We had this come into play on a job recently where the cable had to be supported every 5 feet but the bar joists are 6 feet part and our contractor was not allowed to drill into the deck. The magnetic j hooks were the solution. While j hooks are more common, many applications still call for bridle rings. Obviously the same advantages apply to the bridle rings as the j hooks. With the magnetic bridle ring set up, we have elected to offer the magnetic base, part number MAG4TF separately, allowing you to choose your size of bridle wring plus choose from a standard bridle ring or a ring with saddle. These too can be installed from the floor like the magnetic j hooks. Magnetic j hooks and bridle rings may not be an everyday type of hanger for you. But you will find applications that these great little hangers will fit the bill. MagDaddy offers a nice line up of magnetic cable management products beyond the magnetic j hooks and bridle rings including some excellent mounts for single and low count cable installations. Click here to see their line up. Okay, J Hooks for data cabling really are boring. Saving time and money on your project, now that’s a little more interesting. Check out our generic UL listed j hooks and see how easy it is to save. .The first thing you will note is the price. Our 2″ standard j hook sells for $1.79. That’s not a special price, that is a standard everyday price. Our 3/4″ j hooks are well under a buck. But don’t just check the price, check out the variety. We have the popular multi clip version of the j hook, allowing you to mount quickly to grid wire or 1/4″ rod. By the way if you need to install a grid wire or 1/4″ rod to suspend your j hooks, we have some great hangers and tools for that as well. One of our more unique offerings is the 2″ J hook mounted to a shooter clip for Ramset & Hilti tools so you can shoot your j hook tight to the concrete deck. We use a quality Ramset ballistic point pin for excellent results even in hard concrete. Spend a little time on our site ConstructionFastening.Net You will find some specialty tools and fasteners you just can’t find anywhere else. One the most common hangers used in structured wiring applications, especially in security cabling where small cable runs are common is the 3/4″ j hook. A variety of configurations are available to facilitate most any application. For your basic wall runs, the standard j hook works well. Depending on the wall, they can be mounted with a variety of screws and small concrete anchors. For concrete walls, they can often be shot on with a Hilti or Ramset type of tool. Many open warehouses have a bar joist type ceiling. Using a 3/4″ j hook with a hammer on clamp makes for quick installations. Most of these bar joists have a flange around 3/16″ of an inch. If you have an I beam, you will need a thicker hammer on clamp. Also check for a manufacture that offers the j hook set up to rotate 360 degrees so you can run any direction on the bar joist. 3/4″ j hooks with multi clips or bat wings as some call them area designed to grab on to ceiling grid wire, pencil rod and all thread up to 1/4″. Simply squeeze the clip and position at desired height. Make sure to follow codes as to whose grid wire you are clamping on to! If you need to mount your 3/4″ j hook directly to the ceiling, a couple of set ups are available to you. If you are fastening to wood or a metal deck, simply use a 3/4″ j hook with an angle bracket attached, select the appropriate screw and drive up with your driver. If you have a concrete deck, you can use a Tapcon anchor or a 3/4″ j hook with a nail installed for use in a Hilti, Ramset and other powder actuated tools. Keep a variety of 3/4″ j hooks in stock and you will be able to handle any situation you run into in the field without spending time shopping for individual components to get the job done. When the flange on your bar joist or I beam is to thick or when you just want a little added security, try our j hooks pre assembled to a screw type beam clamps. The clamp is rated up to a half inch flange and sets securely with a set screw. While the the j hooks and beam clamp assembly can be easily rotated to any position with a number three phillips screw driver, we are offering them assembled to run either with the steel beams or against them. When you figure what your cost is per minute for one of your guys in the field, anything to speed up the install is worth doing! Available in both 2″ and 4″ sizes, our j hooks with beam clamps are UL listed and offer you a nice cost savings over brand name j hooks. 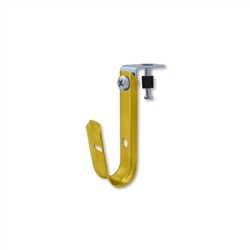 In addition to j hooks with beam clamps, we offer a complete line of j hooks and data cable hangers, all keep your initial cost and your labor cost down. Visit our site ConstructionFastening.Net If you would like a sample of our j hooks with beam clamps, or any of our hangers, give a call toll free at 1-877-212-2377. If your flange is 1/8″ to 1/4″ thick, typical with bar j hooks with hammer on clamp. They offer fast install with just a whack of the hammer. Available in both 2″ abd 4″ sizes they rotate a full 360 degrees. See them here. Shoot Up J Hooks With Your Hilti & Ramset Tools! be the fastest way to install data cable to a concrete deck. Available in both 3/4″ and 2″ sizes these UL listed j hooks offer the support and flexability you need for your cable runs. We use a ballistic point pin ceiling clip for a better success rate even in hard concrete ceilings. These pins work in most Hilti, Ramset, Simpson, Powers and other powder actuated tool. If haven’t used a powder actuated tool in your install work yet, you are missing out on a great time saver. Not only do they work well with our shooter j hooks, but many applications lend themselves to a supported cable run. For overhead fastening we recommend the Ramset Viper 4 tool kit. It’s sectional pole tool system and light weight make the Viper 4 a great tool for installing ceiling clip assemblies and rod assemblies. If you need to shoot to the wall from time to time, consider the Ramset Cobra, a Hilti DX-350 clone tool. A fixed fiberglass pole tool is available for this tool as well. Give our shooter j hooks a try today! J Hooks with bat wings are one of the most common types of j hooks used for data cabling. The bat wings as they are called are clips that will mount on to pencil rod, ceiling grid wire, 1/4″ all thread and smooth rod. While they will clip on to 3/8″ all thread with a little effort, not all j hooks with bat wings show data for these applications. This usually isn’t a real issue as the loads are usually quite low. While clipping on to existing ceiling grid supports is a no no, j hooks with bat wings still have many applications. You can shoot up your own ceiling wire and clip and add on j hooks at different heights for different runs. Shooter clips are also available with 1/4″ all thread installed which work perfect in situations where you are not allowed to hang on a grid wire or where you would want to have more of a rigid install. Simply shoot in the rod and add you j hooks with bat wings at the desired level. J hooks with bat wings are available in sizes ranging from 3/4″ to 4″. Check out our j hooks with bat wings along with a wide variety of data cable hangers online. Check out the brief video below for some installation ideas when you are using bridle rings. While bridle rings may not be the data cable hanger of choice for data sensitive cable, for many simple wire applications they still fit the bill. The fastest way to install a bridle ring to concrete is with our shooter clip designed for use in Hilti, Ramset and other powder actuated tools. Not shown in the video are the Sammy Super Screws which make for easy install of bridle rings in metal decking and wood.